Darwin’s portrait was known to most Danes. 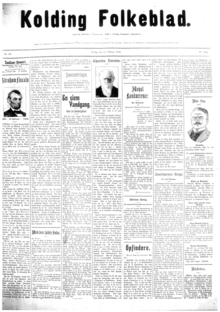 Here in Kolding Folkeblad in 1909. Click for larger image. Here you can find material relating to the reception of Charles Darwin and the theory of evolution in the period from 1859 to1920. You can find the story of when Darwin came to Denmark and the reactions to Darwinism. They are divided into three categories: scientific reactions, religious reactions and popular reactions (reviews, satire and illustrations). Furthermore, there is a list of the Danes who debated Darwinism as well as a collected list of articles and books on Darwin and the theory of evolution in that period. You also have access to Darwin’s collected works online and to the Danish translations of said works.